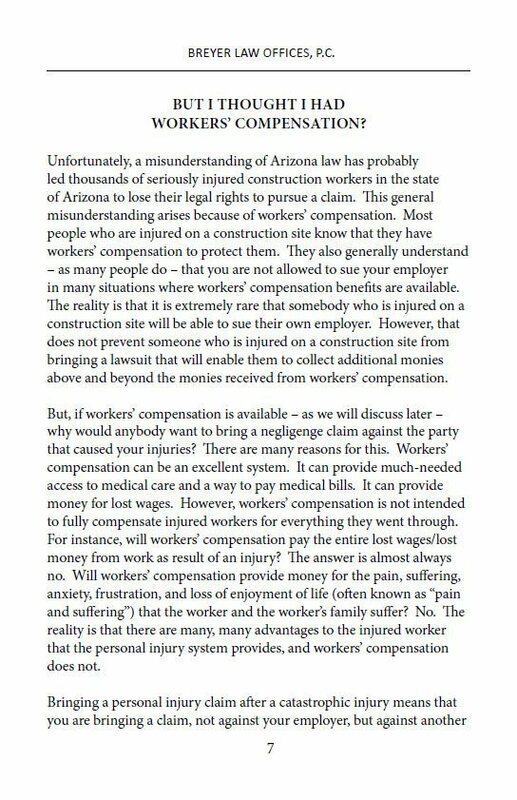 Home Free Arizona Injury Law Guides After Your Construction Accident: The Clock is Already Ticking - Find Out Why! After Your Construction Accident: The Clock is Already Ticking - Find Out Why! In this book, we give you the information you need to get the legal outcome you deserve. 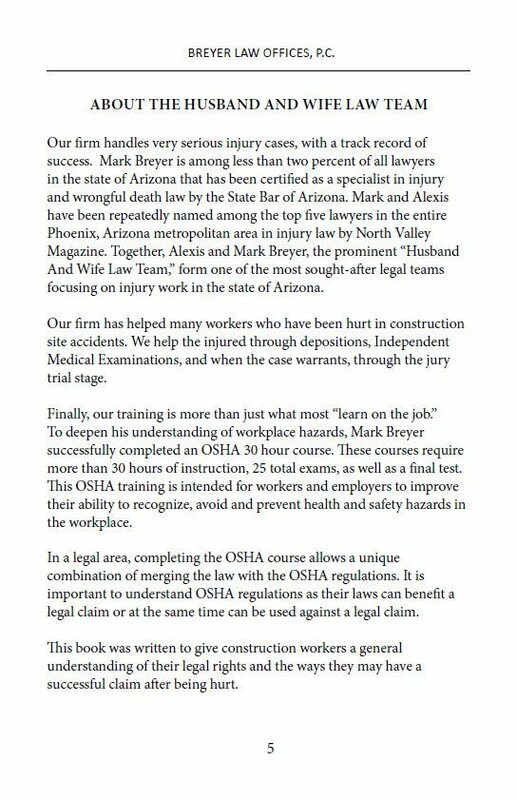 Phoenix Injury Lawyer Mark Breyer has successfully completed the OSHA 30 hour course focused on safety hazard regulations. 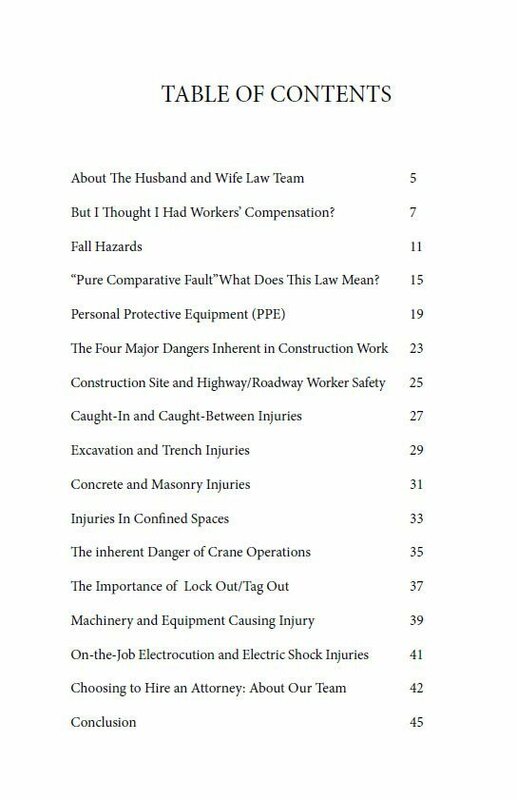 This allows a unique combination of merging the law with OSHA’s regulations and can, in turn, benefit a legal claim. 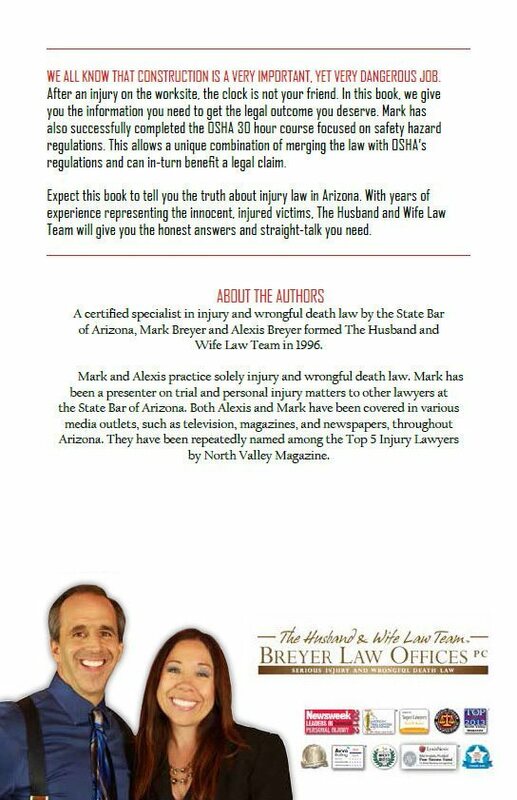 Expect this book to tell you the truth about injury law in Arizona. With years of experience representing the innocent, injured victims, The Husband and Wife Law Team will give you the honest answers and straight talk you need. “Pure Comparative Fault” - What Does This Law Mean? How Did You Hear About Our Book? I (spouse or child) have been injured in an accident or have a wrongful death claim. Please rush my order. A friend or relative has been injured in an accident or has a wrongful death claim. I would also like to receive your newsletter. Arizona Serious Injury Lawyer Disclaimer: The legal information presented at this site should not be construed to be formal legal advice, nor the formation of a lawyer or attorney client relationship. Any results set forth herein are based upon the facts of that particular case and do not represent a promise or guarantee. Please contact an accident attorney for a consultation on your particular legal matter. This web site is not intended to solicit clients for matters outside of the state of Arizona. Website Design and Search Engine Optimization by: SLS Consulting .